Hey Everyone! Hopefully all of you wonderful readers are having a lovely weekend. Luckily my flu is finally going away, which I'm grateful for. Besides me feeling okay, I'm actually excited to share my next post. Today I have for you some holiday theme nails I did for China Glazes Nail Art Contest their having. It just shows Christmas doesn't have to be white, green or red! It could be anything you want it to be. So when I found this cellphone wallpaper, I just knew I had to use it. Luckily for the contest I had most of the colors on hand. For the base, I applied two coats of OPI My Vampire is Buff. 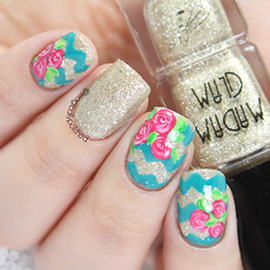 Which is such a perfect ivory shade for this design. Then I've decided not to go too much on the design, since there was soo many little details too use. So I picked four fingers to be the ornaments and my ringer finger for the birds. For each of the ornaments, I drew them with a nail art brush, using China Glaze Sun of a Peach, For Audrey, Bottoms Up and Foie Gras. I then added smaller details on the ornaments and birds with a dotting tools, using Essie's Blanc and China Glaze Foie Gras. I then sealed the design with Duri- Super Fast Dry Through Top Coat, that's it!